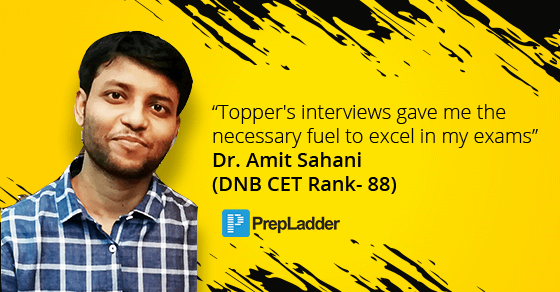 PrepLadder congratulates Dr. Amit Sahani on securing Rank 88 in DNB-CET July 2018. We wish him all the best in his career and future ahead. Hello, I am Dr. Amit Sahani. I graduated from Gauhati Medical College, Guwahati in 2013. I gave JUNE DNB-CET 2018 and achieved the 88th RANK with 735 marks and 99.65 percentile! Definitely, Theory+ MCQ's. One should atleast have the strong basics before attempting any MCQ. Usually topics and concepts are repeated more often than the exact MCQ's which one usually get to practice. Therefore, I myself focused more on the Theory part and building concepts rather than just practicing MCQ's. One should give 70% of the time to the theory part and 30% of the time on the application part by practicing MCQ's! I think it depends on the seat one is aspiring for as well as the aspirant itself. If one is aspiring for a top branch then one should start his/her preparation as early as possible in his/her undergrads whereas if one is aspiring for a not so top branch then he/she can be a bit relaxed and start their preparation by the 3rd or final year! So, these are my ranks so far. My journey is very long so, I will only tell important points here. The point to notice here is that I only started my preparation in 2017 which again was half-hearted for just 1-2 months in April-June which is reflected in my ranks too. After that I couldn't carry on my preparation due to some reasons which also got reflected in my ranks in NOV-DEC exam. Then in 2018 I finally decided to give full time to my preparation and hence so my results got improved drastically! My strategy was basically to cover the theory part sufficiently which I was lacking previously and also practicing more mock exams! REVISION is the key to success to any PG entrance exam! Unfortunately, I couldn't get enough time for revision as my preparation is not over yet. 50% of my syllabus is still left to cover. I didn't give any time for revision as i am yet to finish my one full reading all 19 subjects! Ideally minimum 3-4 revisions are required to get a good rank in any national PG entrance exam! Yes, it definitely did. I gave the free National mock tests conducted by PrepLadder for various exams which are quite good to assess your preparation and formulate your further strategy. All the questions in the exam were of the current pattern which also helped me a lot. Apart from that the topper's interviews gave me the necessary fuel to excel in my exams..! Yes, I did make a timetable from time to time according to my preparation and the time left but unfortunately I couldn't follow it up religiously. I was below average student during my MBBS and got back to back supplementary in medicine practical’s in final year due to which i took one extra year to pass my final year! My MBBS aggregate is 56.77%. I believe no subject as a whole is difficult for me but only difficult topics in some subjects! Don't leave any subject untouched or less covered if you are aiming for a top rank! Give more time to cover theory part than practicing MCQ's. Read smartly and quickly and not extensively. Revision is the most important determinant of your success! I wanted to attempt as much as possible so I attempted all questions! You must attempt high in order to score high unless you are very sure of getting a very good rank by attempting less! I want to say that anything is possible and there is no hard and fast rule to follow any particular strategy. I am proving it through my journey. I never attended any coaching class not even specific subject teachers! I never read any standard reference books. I only prepared through subject guide books thereby breaking the myth that guide books are trash. I was very flexible in my strategy in order to persevere for a long period of time! I always believe that your 'WHY' to succeed is the single most biggest factor to achieve any big success in life! We thank Dr. Amit Sahani for sharing his success story.